for presentation in protein crystallography. PO Box 218. Hawthorn, Victoria 3122. Australia. PDF file, Copyright © J. Appl. Cryst. Tired of looking trying to disentangle chickenwire stereo-pair images? Try CONSCRIPT! CONSCRIPT is designed to generate Gouraud shaded isosurfaces of protein electron density for high quality presentation in journals. Electron density maps in protein crystallography are typically presented as "wireframe" or "chickenwire". Whilst this method has been enormously successful for interactive atomic model building, it is not ideal for presentation. In particular, chickenwire views often appear cluttered and adequate illusion of depth only is achieved with stereo-pair presentation. CONSCRIPT allows protein electron density isosurfaces to be rendered in triangulated form suitable for input into the popular MOLSCRIPT and Raster3d packages. This method of display leads to more easily interpretable pictures and can dispense with the need for stereo-pair presentation. gzip/tar archive for g77 under Redhat Linux. 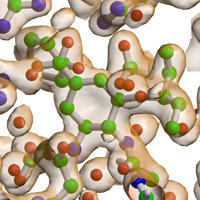 A program for generating electron density isosurfaces from Fourier syntheses in protein crystallography.